A.I have little to no "personal" free time to shop, B.When I do shop I find myself feeling overwhelmed especially in those huge 1million sq.ft. Forever 21's, and C. I get side tracked and start shopping for baby clothes because it's so much easier then shopping for myself. I spotted a helpful solution to this problem while browsing through emmas designblogg (a new favorite blog of mine!) When I saw this photo the first thing that popped into my mind was the word "brilliant." How awesome/time saving would it be if you could hang your outfits for everyday of the week on this rack (and if your clothes are fairly fashionable, it becomes a design feature in the space as well). You could choose all of your outfits for the week on Sunday and not have to even think of what to wear for a whole 7 days! What do you think? Would you use something like this in your own home? That's a great idea! Getting myself dressed is like the hardest part of the day. Nothing fits after baby and I have zero desire to shop (my 1st trip to F21 was a horror - it's like Ikea!). Totally agree that it's more fun to shop for the kiddos! This is such a good idea! 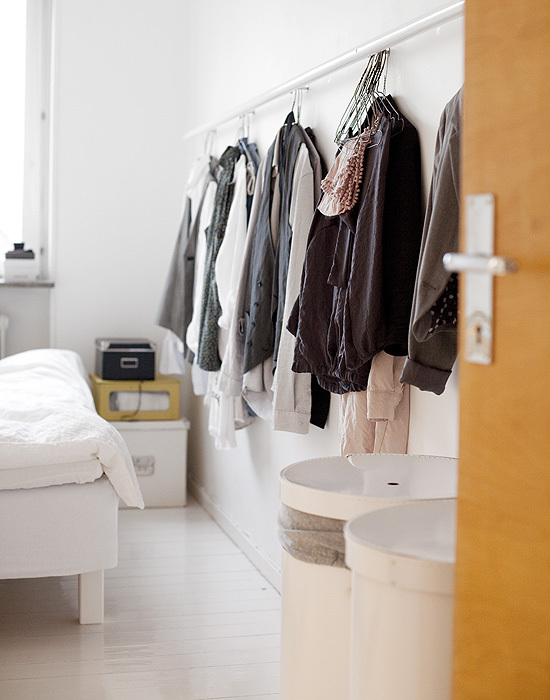 If I had an enormous walk-in closet I would definitely want to do this. It would save me so much time every day when I can't decide what to wear! That would add the stress of making sure my clothes matched my bedroom...and all the clothes for the week would have to match eachother!!!! I could so not do this, hahahaha. But I LOVE the picture. Cute! I don't have that problem of migrating toward baby clothes...in fact I do the opposite....hahahaha, not that I actually ever get to buy anything anyway. We mostly buy clothes for Jake not mom and kids. brilliant idea ! i do that every night for the next morning , but doing that for the whole week would save loads of time ! Looks like a fantastic idea! I'm hopping over to have a look! Thanks sweetie! Have a great Independence Day weekend! This is genius! I need to implement this into my routine because I hate putting together outfits lately. Also, I think planned out outfits always look more tasteful anyway! Love that idea. How smart. I think that's what Nat needs.